Run Effective School Board Meetings! 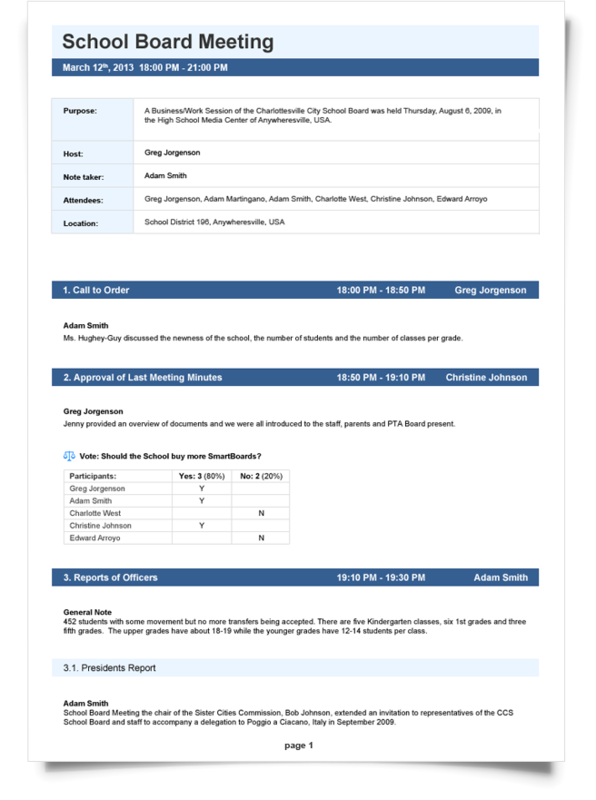 Want to streamline your School Board meetings and make the most out of your time? Then you have come to the right place! MeetingBooster allows you to create agendas, assign tasks, keep track of notes and create meeting minutes that can be posted online or distributed to participants. 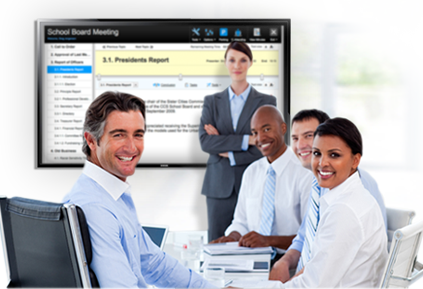 MeetingBooster helps you to take control of your School Board meetings, PTA meetings and Committee meetings! MeetingBooster is a cloud based system that is integrated with MS Outlook for easy scheduling of your School Board meetings. Just click the MeetingBooster icon in the Outlook calendar invite dialog to create your meeting ID. This is automatically inserted in your invitation. With online access, you can also schedule the meeting using your MeetingBooster account. In either scenario, MeetingBooster's conflict scheduler makes it easy to select a time when everyone is available, simplifying the scheduling process. Creating your agenda is easy when using MeetingBooster. From the Meeting Details section, select the Agenda tab and use the simple MS Office style interface to add your topics. Users can also left click the meeting in their Outlook calendar and select the Meeting Agenda icon in the ribbon. This launches MeetingBooster's online agenda module where you can easily create your School Board meeting agenda. Start from scratch, use a School Board meeting agenda template, or base your meeting on the last meeting's topics. MeetingBooster makes it easy to allocate times and presenters for each topic and even attaches supporting files. Easily send out pre-meeting tasks to attendees using the Task tab. This ensures that all participants will receive the agenda and task information prior the meeting, guaranteeing better meeting preparation. PowerPoint has been the meeting presentation tool of choice for many years, however most of the time no one ends up taking proper meeting minutes. This is a requirement by the LEA and DOE, and MeetingBooster assists in the proper formatting of the notes and minutes. With MeetingBooster's meeting module you can actively take notes during the School Board meeting and allocate tasks, adding accountability and accuracy. Meeting tools such as voting and pros/cons help to get decisions made during the meeting. The results from the meeting tools are captured as individual notes, and are transferred directly to the meeting minutes. When you end a MeetingBooster School Board meeting, the minutes are generated automatically. The minutes can be proofread and edited for up to 14 days after the meeting is ended. 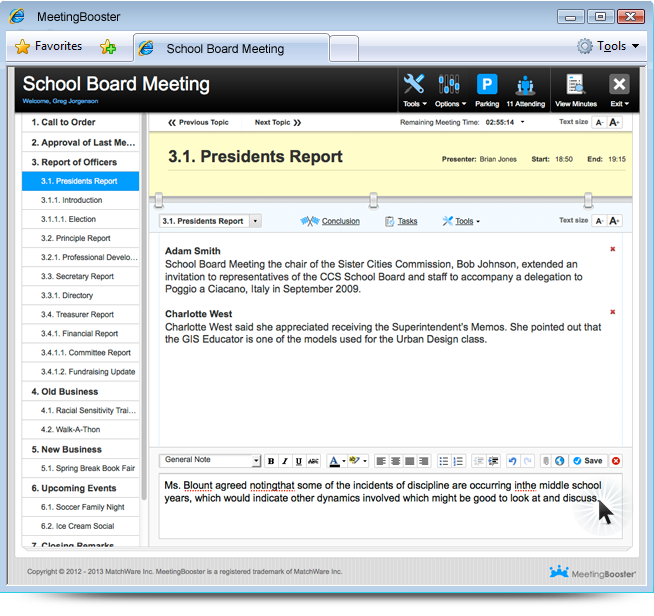 Users have the ability to customize the notes using different styles, adding a school logo and viewing either detailed or conclusion notes formats. It is a requirement that School Board meeting minutes have a signature page for the respective parties to sign and approve. MeetingBooster auto generates a separate signature page where the names will be added to the PDF minutes document. The School Board meeting minutes are automatically sent to the participants as a PDF document or you can choose to publish the PDF document online for public access. MeetingBooster stores all of the meeting information in the cloud, making it easy to access and search notes from past meetings. A built-in permission system ensures that only authorized persons will have access to certain meeting minutes. 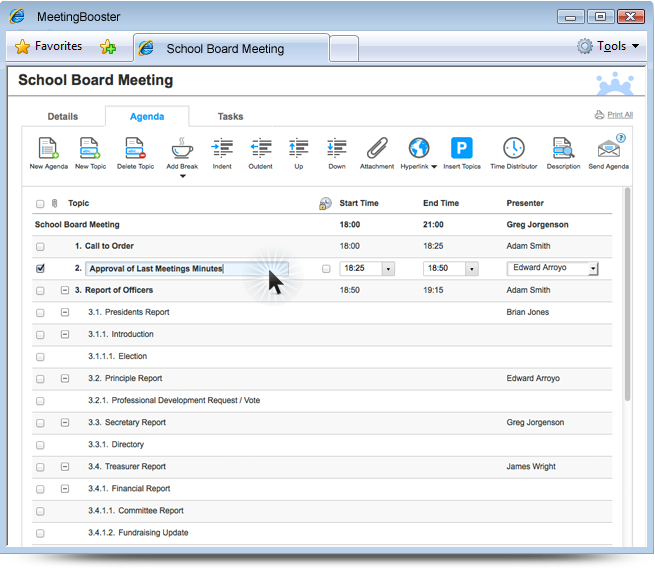 MeetingBooster makes it easy for any school to effectively manage and back up its School Board meeting activity.